Motorists stranded on Interstate 610 look out over floodwaters after Harvey inundated the Texas Gulf coast with rain in Houston, Texas, Aug. 27, 2017. A man walks through floods waters and onto the main road after surveying his property which was hit by Hurricane Harvey in Rockport, Texas, Aug. 26, 2017. HOUSTON — Officials here warned of “catastrophic” and potentially historic flooding in the nation’s fourth-largest city Sunday morning, as Harvey continued to pummel Texas, dropping more than 2 feet of rain and causing dire, and deadly, flash floods. At least five people have been reported dead as a result of the storm, according to the National Weather Service. The flood warnings also came with urgent pleas for residents to be cautious, stay indoors and not attempt to travel flooded roadways. Police and rescue workers implored residents who see floodwaters rising near their homes to make their way to the highest point possible — even if it is a roof — while awaiting rescue. On Saturday night, a woman was found dead by her vehicle, believed to have been trapped during a flood. The U.S. Coast Guard dispatched five helicopters and Houston is expecting about 40 additional boats to find those in need of help, Mayor Sylvester Turner said in a news conference. “This disaster is going to be a landmark event,” Brock Long, director of the Federal Emergency Management Agency, told CNN’s “State of the Union.” He said he expects the agency to be working in the area for years as Texas recovers from the storm. 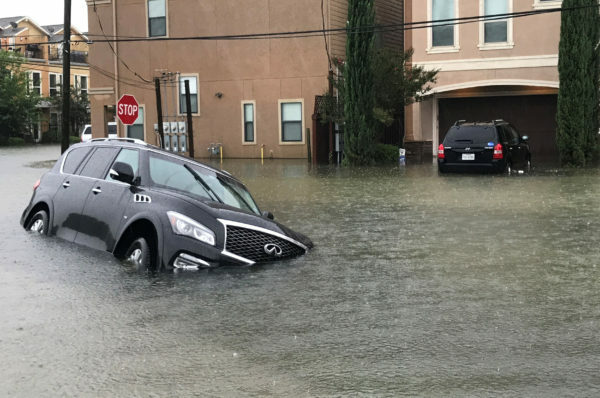 By 7 a.m. local time Sunday, the National Weather Service had recorded at least 27 inches of rain in Houston, with an additional 3 to 7 inches expected. Warnings for flash flooding and tornadoes remained in place for a large swath of the state, and storm surges are expected along the coast, bringing flooding to typically dry areas. William H. Hobby Airport was shut down. As it scrambles to open shelters across Texas, the Red Cross command center in Houston is now “physically isolated” because of floodwaters, said Paul Carden, district director of Red Cross activities in South Texas, which includes Corpus Christi. “The advice is if you don’t have to be out, don’t be out,” said Bill Begley, a spokesman with the Joint Information Center in Houston at around 7:30 a.m. local time. He said most of the calls for help they’ve received have come from residents who tried to drive through the storm and wound up getting stuck in high water. Southwest Airlines flight attendant Allison Brown estimated that at least 50 flight attendants, a number of pilots, airport staff and hundreds of passengers have been stranded at William P. Hobby Airport since at least 1 a.m. Sunday. Brown said the airport flooded so quickly that shuttles were unable to get to them out. They were told by police that it would be unsafe to attempt to leave. The Marriott Courtyard Hotel in Southwest Houston, along the banks of the Brays Bayou, was surrounded by floodwater when guests woke up Sunday morning. The bayou had overflown its banks and completely swamped a bridge near the hotel, with waters rising at least 10 to 20 feet or more since Saturday. Its powerful brown flow carried large tree branches and other debris. All roads in the area were underwater, and a park across the bayou was completely flooded. A car nearby had been abandoned, its doors left open. City traffic lights were still blinking red and green over the empty and flooded bridge, but most buildings visible in the area seemed to be dark and possibly without power. Local station KHOU went offline while covering a live rescue of a driver in an 18-wheeler stuck in more than 10 feet of water near the Interstate 610 loop. The reporter was able to flag down a rescue crew, but as the rescue was about to take place, the station went dark. The main office said the station had to evacuated because floodwaters seeped into the building. Harvey pounded the Texas coast on Saturday, making landfall as a Category 4 hurricane that destroyed buildings and caused widespread power outages as residents evacuated towns. Later downgraded to a tropical storm, Harvey crept inland, then stalled and dropped hours of torrential rain that officials said has caused catastrophic flooding across a broad section of the state. Around 9:15 p.m. local time, police found the body of a woman in southwest Houston, said Kese Smith, a spokesman for the city’s emergency management team. He said that officials believe the woman drowned after she drove into high waters and then tried to leave her vehicle. The woman in Houston was Harvey’s second confirmed fatality. 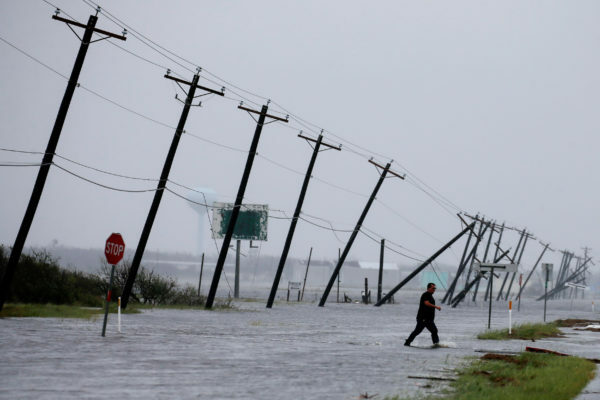 Officials earlier confirmed another death near the small coastal town of Rockport, which took a direct hit from the storm, as search and rescue operations continued in ravaged areas that are still largely inaccessible. Officials said Rockport could receive as much as 60 inches of rain through midweek. Among the cities at risk of major flooding is Houston, with a population in excess of 2 million. Saturday evening, the city was buffeted by mammoth rains and nonstop lightning. The National Weather Service warned of a flash flood emergency for areas of Southeast Texas, including Harris County, where Houston is located. Authorities in the Houston area reported they’d received calls from residents climbing into their attics to escape the rising water. Water overflowed the banks of area waterways in more than 30 places, spilling into roadways and homes. Parts of Interstate 45 had more than 60 stalled vehicles on them, tweeted Harris County Sheriff Ed Gonzalez. Gonzalez fielded tweets from some residents who posted pleas for help, saying 911 lines were busy. “We’re on it, but so widespread, it’s hard to get to everyone immediately,” the sheriff replied to one Twitter user. In the coming days, forecasters expect the storm to meander south and east, and possibly slip back out over the warm gulf waters, allowing it to regain its strength to some extent. All the while, it will dump what could be historic quantities of rain — 15 to 30 inches in many areas, with as much as 40 inches in isolated areas, according to the weather service. As many as 300,000 people across the state were without power Saturday afternoon, and wastewater and drinking-water treatment plants were offline. The National Weather Service predicted “major flood” conditions at some 49 river locations across a vast expanse of coastal Texas. In the island town of Port Aransas, near Rockport, officers conducted a search and rescue mission for eight people reported missing, an Aransas County sheriff’s deputy said. That city was directly in the line of fire of Harvey and emerged Saturday looking trashed, with the streets deserted and trees and power lines down all over the city. The once-stately oaks in the public square by the historic courthouse had lost many of their limbs. On the main drag through town, the Exxon station looked demolished, along with a Valero station nearby. Plywood that had been nailed to storefronts littered the streets. Shingles had been blown off roofs. Bryan Simons, spokesman for the Victoria County Sheriff’s Office, warned that more devastation was coming. “There will be life-threatening, catastrophic flooding here,” he said. The Tres Palacios River has risen more than 20 feet near Midfield, according to the U.S. Geological Survey. The San Bernard River near the town of Sweeny is expected to rise more than 10 feet above its 1998 record flood stage. The Brazos River is expected to break a flood record set last year, and officials have ordered mandatory evacuations in low-lying areas of Fort Bend County. In the southwest part of Houston, Brays Bayou was swelling with fast-flowing, debris-filled brown water, and a tornado touched down in a suburban neighborhood. He, along with about 50 neighbors, turned out Saturday morning to help clean up. Volunteers chopped fallen trees, hauled away crumpled fences and gathered debris while roofers went to work. 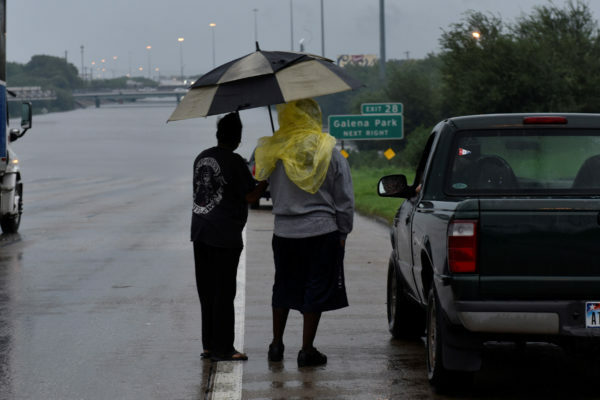 To the west, San Antonio Mayor Ron Nirenberg urged residents to continue to stay off the roads as Harvey neared the city and brought wind gusts of up to 60 mph and heavy rain. The city is under a flash flood watch and tropical storm warning. The city closed 10 roads because of high water, and officials expect that number to grow. The storm made landfall at 10 p.m. local time Friday with 130 mph winds — the first Category 4 storm to hit the United States since Charley in 2004. By late morning Saturday, it had lost some of its punch, but still had hurricane-force winds of 80 mph, having drifted to about 25 miles west of the inland city of Victoria. Shortly after noon, the National Hurricane Center downgraded Harvey to a tropical storm, with sustained winds of 70 mph. Weather officials took to social media and the airwaves Saturday in an effort to persuade people not to become complacent because of the relatively muted impact in places away from the Rockport area. In Galveston, a coastal city 50 miles south of Houston that lived through the last big Texas hurricane — Ike, in 2008 — residents seemed unconcerned Saturday morning. At the packed Waffle House — one of the few businesses open in the area — Galveston residents Dottie and Kevin Bowden ate breakfast with their 16-year-old granddaughter, Savannah Stewart. Farther east, the hurricane has put officials in New Orleans and across Louisiana on alert, and Gov. John Bel Edwards said Saturday that it could be a week before the state has to cope with flooding. He said the pumping system in New Orleans, which flooded earlier this month after a heavy downpour, is steadily improving. “We’re a long ways from being out of the woods, but we are very thankful it hasn’t been more severe up to now,” he said of the storm. Trump signed a disaster proclamation for Texas on Friday night after Abbott, the governor, sent him a written request saying that “Texas is about to experience one of the worst natural disasters in the history of the state.” White House aides said Trump will visit Texas soon. Washington Post writers Tim Craig, Brittney Martin, Ashley Cusick, Mary Lee Grant, Sofia Sokolove, Emily Wax, Joel Achenbach, Sandhya Somashekhar and Angela Fritz contributed to this report.